Designed for both business and leisure travel, Parkville Motel is ideally situated in Brunswick; one of the city's most popular locales. The city center is merely 2.5 km away and the airport can be reached within 17 minutes. With its convenient location, the hotel offers easy access to the city's must-see destinations. 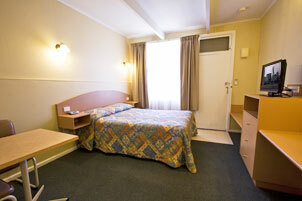 Parkville Motel offers impeccable service and all the essential amenities to invigorate travelers. This hotel offers numerous on-site facilities to satisfy even the most discerning guest. Step into one of 20 inviting rooms and escape the stresses of the day with a wide range of amenities such as internet access – wireless, coffee/tea maker, air conditioning, hair dryer, internet access – wireless (charges apply). Besides, the hotel's host of recreational offerings ensures you have plenty to do during your stay. Whatever your reason for visiting Melbourne, the Parkville Motel is the perfect venue for an exhilarating and exciting break away. 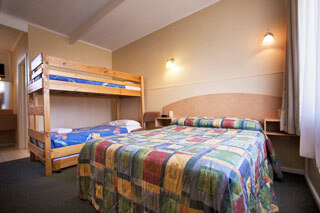 Our Family room consists of 1 queen bed, 1 bunk bed and 1 trundle bed. The rack rate advertised is for 2 adults and 2 children. $20 extra for the 5th person. Room facilities include LCD TV with DVD player, microwave, toaster and tea and coffee making. Our Standard Queen room features a Queen size bed and reading table. Room facilities include LCD TV with DVD player, microwave, toaster and tea and coffee making. Our Twin Share room features a Queen bed and a single bed. 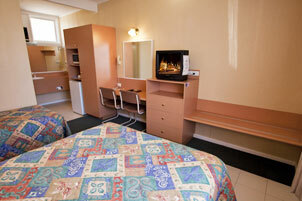 Room facilities include LCD TV with DVD player, microwave, toaster and tea and coffee making.